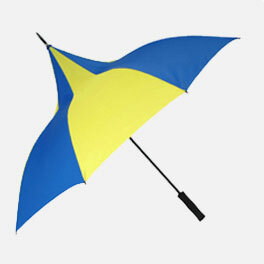 The Happy Days blue and yellow promotional pagoda parasol is yet another eye-catching design from the ‘Witch’ range. Incorporating our new ‘wind-resilience’ technology it has a canopy width of about 120 cm (4 feet), overall length 104 cm (41″). This promotional pagoda parasol features a high-tech black EVA straight foam handle and push-button auto-open mechanism. A promotional pagoda parasol is an amazing marketing space, which folds quickly and neatly away when not in use. Your clients will be happy, even proud to carry it around, advertising your brand, logo or message for you, free of charge… in the pouring rain! If you wish to place an order or discuss more, call us on 01525 382 938 or contact us today!